Thank you for that fantastic tool, it solved my problem with Sonos ("Imported Playlists"). It is working very well. for some reason, export to M3U is taking a REALLY long time (as in hours/days). Used to take only a couple of minutes. All files stored on local HDD. I would really appreciate if someone could point me in the right direction to resolve this. buetthead wrote: for some reason, export to M3U is taking a REALLY long time (as in hours/days). Used to take only a couple of minutes. All files stored on local HDD. You need to be more specific. Do you export the same nodes to the same target folder now as before when they used to take only a couple of minutes, i.e. have you compared it under the same conditions? Did you export auto-playlists or Magic Nodes? Some of them takes too much time to fill the filelist. When you said that all files are stored on local HDD, I suppose you meant on media files, but how about the location of the target playlist files? Do you export them to the local HDD or some network drive, e.g. NAS? thanx for responding, and sorry for my late reply! buetthead wrote: You need to be more specific. Do you export the same nodes to the same target folder now as before when they used to take only a couple of minutes, i.e. have you compared it under the same conditions? In short: Yes same conditions, thats whats puzzeling. I only exported manual playlist (non-auto). Also the exportet playlists are copied to a folder on the same HDD (I later sync that folder to NAS by other means). Maybe there is a simpler solution for my use-case? What I am trying to do: Simply copy ALL playlists to a different folder, while converting them to M3U and change the path from local HDD to NAS-path (to have my mediamonkey playlists available in the NASes playback app). Thanx again for your help!! buetthead wrote: In short: Yes same conditions, thats whats puzzeling. I am short with ideas why is that happening to you. The only remaining thing that I could try in your place is to turn off the "Exclude - unavailable files" because it could slow down the add-on, but only with slow drives. Since you told that your media files are stored on local HDD, which I suppose is fast enough, I doubt that turning off the mentioned option will change anything, but it is worth a try. - post the specified log file here or send it to me using my e-mail address. Ok, I will do what you reccomended. Your help is much apreciated!! Ok, so here is the link to the logfile. I wonder if the event-logger is set up correctly. Seems to me it is not showing a lot of information?! Before I write a "debug" version of the script which will log more data, could you tell me have you tried to turn off the "Exclude files: Unavailable" option? Also, you could try to turn on the "Skip export of: Autoplaylists" option. I see from your screenshot that your media files are on the G: drive. Is that internal HDD? Hm, it keeps getting stranger: I did a re-rum with the settings you recommended (see link). It was going somewhat faster at first, until I got an error saying 'unable to create directory...'. Upon selecting retry, it was going blazing fast but also moving the actual mp3s along, too. While the script runs, I noticed the entire machine becoming really unresponsive. This add-on doesn't move media files. 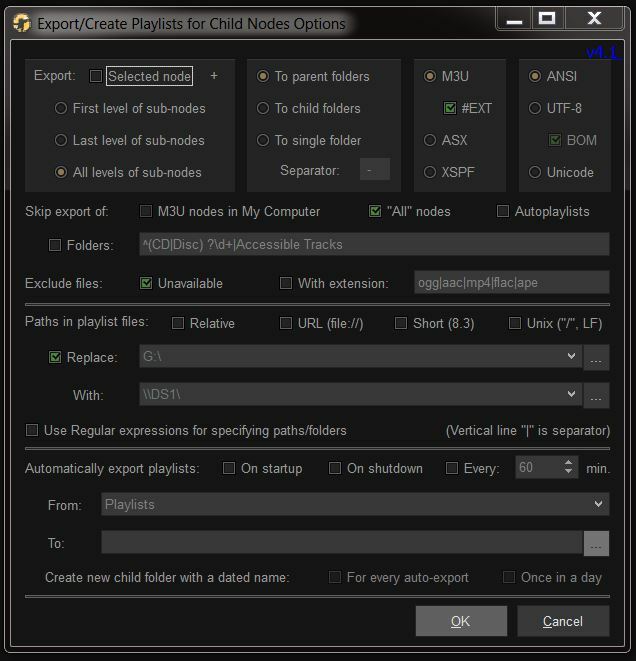 It could copy media files if you choose the "Export Child Nodes to Playlist Files & Copy Media Files" option, but it will not move them. Yes, the "Export to M3U" is a built-in MM command. If it is just as slow, and if you are getting errors saying that it is "unable to create directory", then it is very probably a problem with your drive. You should make a backup of it as soon as possible. And try some more refined program than CHKDSK. You still didn't try my suggestion to turn off the "Exclude files: Unavailable" option, while I expect that it is a main reason for the slow export. You see, with that option turned on, the add-on tests the existence of each media file and, if you have slow or problematic drive, that testing will slow it down. Also, try to export playlist files to the SSD, i.e. C: drive. Sorry, I was unclear. I should have said copied instead of 'moved'. ZvezdanD wrote: You still didn't try my suggestion to turn off the "Exclude files: Unavailable" option, while I expect that it is a main reason for the slow export. You see, with that option turned on, the add-on tests the existence of each media file and, if you have slow or problematic drive, that testing will slow it down. Also, try to export playlist files to the SSD, i.e. C: drive. Seems I don't understand the UI... The box "exclude files: unavailable IS ticked" (as in my above screenshot) Does it have to be un-ticked??? As for the drive: I am exporting to the SSD. I should not do this kind of stuff late at night I misunderstood what you said about the exclude missing files. The option is unticked now, but sadly it does not make a difference. I understood that you are exporting playlist files to the same drive with media files, which is G:, which is HDD, but now you say that you are exporting to SSD. Which of that two is true? Anyway, how about this: just untick "Exclude files: Unavailable" option to disallow testing of media files and try to export playlist files to different disks, maybe even to some external one, like USB flash drive. If that doesn't change anything, then try to install portable version of the program to some another drive and copy your current database file to it. Maybe your drive on which you have the program and database is faulty one. You could also try to export nodes from My Computer branch having media files, instead of nodes from Playlists branch. If that goes fast and well, than maybe you have corrupted database file and maybe it could help if you optimize it. By the way, as I said, this add-on will not even copy media files unless you choose the mentioned option. If you want just to export playlist files, do not use that "... & Copy Media Files" option. exept a new portable install. Just start installation and you will be asked if you want to install portable version. If you have an access to other computer just for test, you could only install MM and this add-on on it, and copy the current database file to it, but you don't need to copy media files to it to be able to export playlist files, assuming you have ticked off the "Exclude: Unavailable" option. Did you try to export nodes from My Computer branch?